This week’s Documented Life Project prompt was all about feathers. The prompt suggested that group members either draw, paint, doodle or sketch a feather or even add a real feather. I was actually contemplating adding a real feather if I could find one in the garden because we have beautiful blue jays, red cardinals, woodpeckers, tufted titmouses, various finches and even the odd hummingbird visiting our feeders. I thought if one of those shed a feather in my garden, I would incorporate it as I have not yet art journalled with something three-dimensional. However, it turns out that possession of any of those feathers would be illegal. In order to protect a whole long list of North American birds, the law states that you cannot possess any of their feathers no matter how innocently you came by them. So back to two-dimensions. I full admit I spent very little time on this week’s prompt. 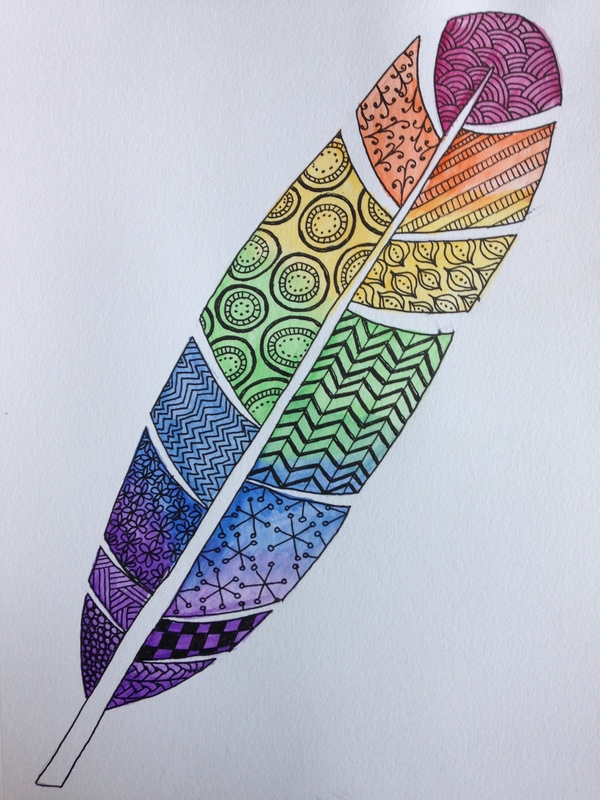 I hurriedly drew a pencil outline of a feather, coloured it with watercolour and then sat and doodled the details while watching TV with my kids in the evening. It probably took me twenty minutes in total. I have actually had a few people quiz me lately about how on earth I find the time to do anything arty. As much as I would love it if I owned Hermoine’s Time Turner, the truth is that I just make the time. I feel better about everything if I can eke out a little bit of time to do something for myself, something creative, something focused and, as such, I carve out the time. It helps, of course, that as of the beginning of this month I have all four of my kids in school on roughly the same schedule but I am still very busy all day long. What I do is take chunks of time to devote to my art. A mid-morning break with a cup of tea might have me sitting and sketching in pencil. Later in the afternoon, I might sit down with a glass of water and fill the pencil drawing with colour. Then, in the evening, instead of watching TV, I will spend some quiet time working in ink, adding detail to the earlier drawing or working on one of my more elaborate projects. I multi-task my way through my art projects and I carve out time that could be spent doing something else. The chores still get done and the kids still get cared for. I just don’t watch a lot of telly and I draw when I am on brief breaks between chores. However, I am going to admit that recently I have taken on way too many creative projects: I have the DLP on the go for the weekly art journal prompt to keep me practising with mixed media; I have joined in with an art swap organised in another mixed media group I belong to; I have my 40 Drawings in 40 Days challenge on the go; and meanwhile I am still sketching out ideas for lino block prints and have an ever-lengthening list of large ink drawings I want to find time to embark upon. The casualty this week was the DLP feather page. As much as it might have been fun to do something much more elaborate and, frankly, something much more mixed media, this simple feather drawing is my offering this week. ps… holy cow! I had no idea that there was a law about North American bird feathers! I’ve been collecting them from the ground for over a decade and have lovely assortment (even a few of our larger feathered friends left us a token here and there)… I’ll have to make sure to keep them under wraps now I guess! I love your drawing. What a strange law about feathers. Oh well, I guess if it protects the birds and stops them going extinct, it has a place in the law-books! I’m new to art journalling (and blogging – currently doing the Blogging 101 course here). Thanks for sharing your ideas and thoughts. I’m now following you, hoping to find inspiration and who knows, perhaps even a new friend! Thank you so much for your lovely comment and for clicking to follow me. I’m actually fairly new to blogging myself (just coming up to a year) and to mixed media and art journaling (I started in February) though I’ve been creating art for many years. I’ve found that being inspired by and learning from others is the best tool. And not being afraid to ask others what might seem like daft questions. I will have to visit your blog and see your art journal pages. Feel free to drop by – well you did AND you followed my blog! Thank you so much. I’m afraid I haven’t done much yet, as the daily assignments so far have only given us one for writing. As I also paint and journal, I like to spread my free time activities out to be able to do all I enjoy! Also reading blogs is fast becoming another fascinating activity to add to my list of “free-time-to-do’s”. I have another post saved to post, but decided I’d wait for the next writing assignment! Thanks so much for your reply and interest. Hugs from Spain.